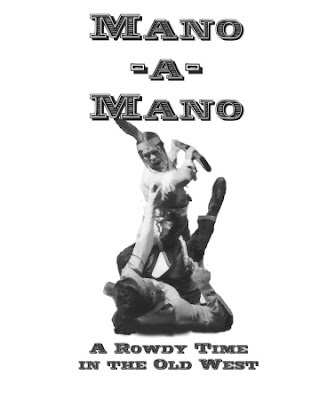 Mano-a-Mano is a fast, universal game system that can be used for skirmish or role playing games. It is mainly concerned with movement, combat, morale, and other connected actions, with lots of detail on gambling, travelling, swag...it's all there. The rest is left to your imagination. So, you can rob the town bank, chase banditos as part of a posse, or fight off an Apache war party. If you want to use these rules for skirmish combat only, the section at the end covers character types, eliminating the need to generate individual characters, and a high speed combat system. So, if you want to re-fight little big horn, you won't be bogged down with the Role Playing parts of the game. Materials needed to play are two six sided, one twenty sided dice, figures for your characters, and any terrain you may want to use (either lead or paper figures will do just fine). Rulers, tape measures, and pencils will come in handy. Once you have all that stuff together, git you a few good fellers in one spot, and git to makin' fun.